Trying to trace involvement of James McGovern (Co Fermanagh ), student at St Patrick’s College, Drumcondra and member of IRB, was very quiet about his past and also very proud of his yellow/black pin and ribbon. I believe he ceased his teacher training and became involved militarly. I think he may have met up with Sergeant Patrick Reilly,RIC who ironically was from his next-door parish in Co Fermanagh. I think their paths may have crossed at the “springing” of Dan Breen and he knew Tom Barry well, I think. but I don’t want to appear to be name-dropping. He finally ended back in Co Fermanagh working as a labourer. Was there a West Cavan Brigade? I came across an exer book recording treasurer’s expenditure in his writing, but it was all very mundane stuff – about groceries bought etc I have his photograph (head only) on a memoriam card in this he is wearing a uniform. Ref: James McGovern, Aghandisert, Derrylin, Enniskillen, co Fermanagh would have been his home address. No-one living there now (1/4 mile from Fermanagh/Cavan) border. So when partition came it was a very, very bitter pill to swallow at the time. Residents went to bed Irish and woke up British citizens. I remember my mother used to cry about it. I used to know which side of the civil war certain pubs in Ballyconnell were by the hostelries my Uncle James used to visit. I owe it to him to find out what I can so that if necessary I can separate fact from fiction. I think a Hugh McDonald from Belturbet area may have been a volunteer friend of his. They used to have to use “safe houses” and dodge “curfew police” when coming home to see their families. Partition left them “on the run” and forgotten. James Hannan was born in Belfast around 1875. I have attached two pdf documents from the Irish Times archive, showing a incident in Belfast in which he prevented the police from entering a Sinn Fein meeting. He was subsequently imprisoned for this offence. My grandfather died in Belfast in 1951, so I never knew him (I was born in 1960). My father let me know that my grandfather was an agent of Michael Collins and lived in Liverpool around 1920 under the assumed name of “Fox”. He was sent by Michael Collins to Liverpool mainly to get guns for the IRA back in Ireland. Prior to this he was in prison with Thomas Ashe and was force fed after being involved in the hunger strike around 1917. The details above are also documented in a book by “Uinseann Mc Eoin”, “The IRA in the Twilight Years”. My father Pat Hannan contributed to this book and there is a chapter in the book dedicated to his account. I also have attached a image from Padraig O’Ruairc’s book “Revolution” . This is a photo of released IRA prisoners in Liverpool in 1922 (page 196) . 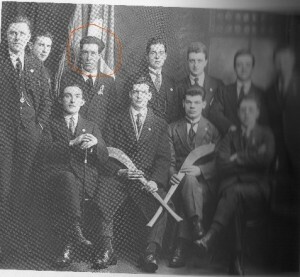 The man I have circled is the image of my father, so it may be my grandfather. I am not sure if it is possible to find out who is in the photo? If you have any advice please let me know. I am looking for information about a distant relative of mine Robert “Bobbie” Bonfield (sometimes incorrectly spelt as Bondfield) who was a member of Na Fianna and graduated to the IRA in 1918 when he would have been about 15 or 16. Bobbie took the anti-Treaty side in the Civil War and was killed by Free State forces in March 1923. I can find information about his death, but nothing about his activities in Na Fianna or afterwards in the IRA – would your researches have thrown up his name at all? Bobbie lived at the family home at 103 Moyne Road, Ranelagh, Dublin 6 if that helps you narrow things down. He was a classmate of CS “Todd” Andrews and may have joined the Volunteers with him as Andrews joined at the same age. At the time of his death he was a 20 year old dental student in the third year of his studies at UCD.